The Omu-Aran community in Irepodun Local Government Area of Kwara has called for adequate recognition for the late retired Brigadier-General David Bamigboye. The traditional ruler of the community and the Olomu of Omu-Aran, Oba Abdulraheem Adeoti, made the appeal in a tribute on the late Bamigboye in Omu-Aran on Sunday. Adeoti said the deceased being the first Military Governor of the State coupled with the landmark achievements his tenure entrenched across the state deserved to be immortalised. According to him, the people of Omu-Aran believe that Bamigboye did his best with the resources available to lay a solid foundation for the state as the first Governor. He said, “In as much as we remain grateful to the state government for its love, assistance and support at all time. “Most recently, we will remain indebted to the government over its supportive roles in ensuring a peaceful selection processes culminating in my coronation as the new Olomu of Omu-Aran. 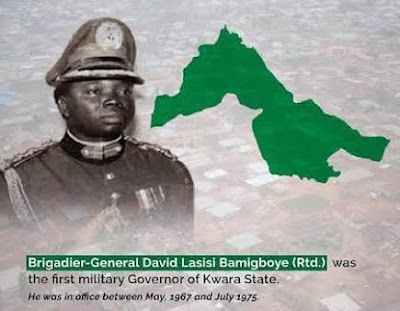 “But regrettably, it is saddened and disheartening that not a single street or building had yet to be named in recognition of our illustrious son, Bamigboye. Oba Adeoti described Bamigboye as a community leader with sincerity of passion for unity and development. He said, “He is always keen on contributing his quota to the transformation of the community with many infrastructure to his credit. Also, Raliat Oyinloye, the immediate sister of the deceased, described Bamigboye as the rallying point of the family while alive. Oyinloye said, “The vacuum left behind by Bamigboye will be very difficult to fill, especially as he was always the rallying point of the family on all issues. “He is a family man to the core, his love for both the young and old is unquantifiable and surely will be missed in all ramifications. Recall that Bamigboye reportedly died in the early hours of Friday at his residence in Lagos after a brief illness at the age of 78. Many people across the state have continued to throng the residence of the Bamigboye’s in Omu-Aran to sympathise with the family over the incident. Born on December 7, 1940, he was credited with establishing the Kwara State Polytechnic, former Kwara State School of Technology in 1972, among his landmark achievements.